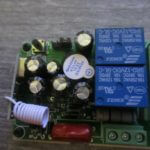 RST: Press and hold the RST button for three seconds to switch the unit on or off. enter the adjustment mode, press ▲ or ▼ to adjust the parameter to the required setting. 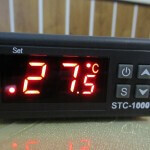 Status LED’s: The left side of the display contains 2 LED’s which indicate status of the unit. a. No light = the relay is not activated. b. Light is on (steady state) = relay is activated i.e. power is flowing to the load. c. Light is on (flashing) = time delay mode prior to activation of the relay. 2. SET LED – Light is on (steady state) when the unit is in the parameter setting mode.  Press “SET” button and hold for more than 3 seconds to enter the menu display. 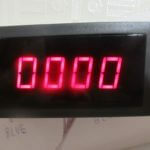  The display will show “HC”, (if not then press press “▲” or “▼” until “HC” appears).  Press the “SET” key again to enter the menu mode. point. The differential can be adjusted from 1℃ to 15 ℃.  Press “▲” or “▼” button until “d” appears on the display.  Press “▲” or “▼” key to adjust the value as required.  Press “SET” to exit the menu – or wait for 5 seconds. thermometer. The unit can be adjusted to plus or minus 5 degrees.  Press “SET” button and hold more than 3 seconds to enter the menu display.  Press the “▲” or “▼” button until “CA” appears on the display.  Press “▲” or “▼” key to adjust the correction setting as required. -2 in order for the display to correctly show 25.
and actual activation of the relay. The main use of this function is to prevent rapid cycling of e.g. the set point the relay is activated (thus turning on the compressor). normally be set to “0”.  Press the “▲” or “▼” button until “PT” appears on the display.  Press “▲” or “▼” key to adjust the time delay as required – to a maximum of 10 minutes. required to set the set point outside this range then HS and/or LS must be changed first.  Press the “▲” or “▼” button until “HS” appears on the display. anywhere between -50 and +110).  Press the “▲” or “▼” button until “LS” appears on the display. 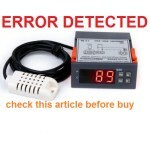  When the sensor is disconnected the display shows “—“. damage and could cause a fire. 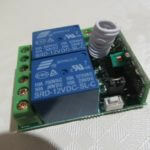 Terminals 1 and 2: Relay contacts – when the relay activates power flows to the load. link) the parameters of the unit are locked and cannot be modified by the user. Note: The load refers to the heating or cooling equipment being controlled by the unit. Hello. 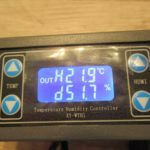 I ordered and received a WH7016C+ digital termperature controller that I thought could be converted to fahrenheit. Do you have a controller that is just fahrenheit? F = C multiplied by 9, and then divided by 5, and then add 32. C = F minus 32, then divided by 9, then multiplied by 5.